This is my most favorite time of the year and visiting our local pumpkin patches is high on my families list of fall activities. 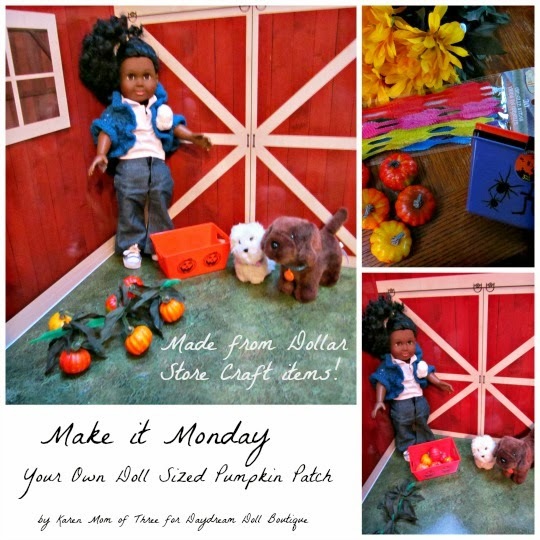 I wanted to make a doll sized version of a pumpkin patch and set out to do so using items from the dollar store. 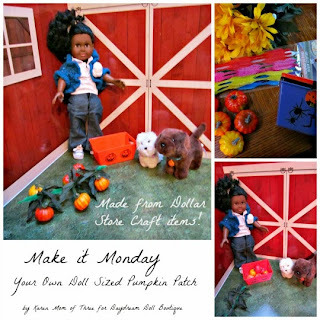 Today’s craft cost less then $6 to create and is no mess. 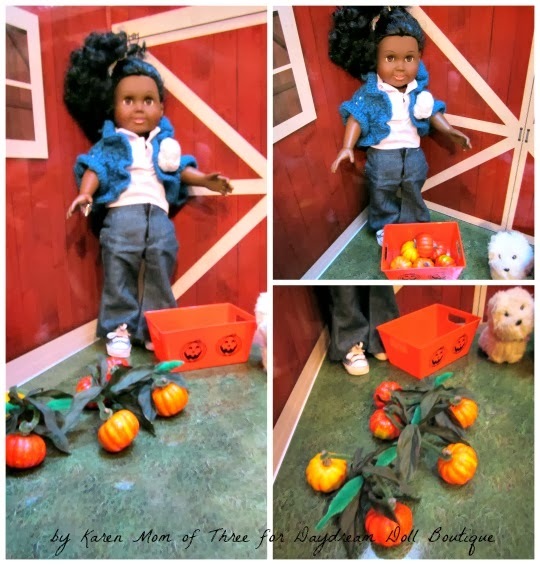 - A Halloween themed container for your doll to pick her pumpkins with. The set I got was 3 for $1, I chose the orange one from the set. Step 2- Bend one regular green pipe cleaner in half and make a cut with your scissors at the bend, repeat on the other green pipe cleaner. 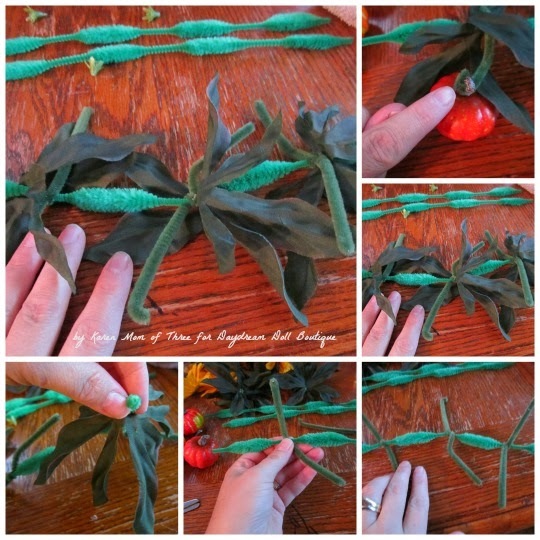 You will only need three pieces so save the other green pipe cleaner for another craft. Step 3- Remove the leaves from the flower stems. I used three flower stem leaves for this pumpkin vine. Step 5- once you have the leaves in place use your smaller cut pipe cleaners on the thinner part of the bumpy pipe cleaner. Shown without the leaves in the photo above bottom right. Twist once so that the pipe cleaner will stay in place. Step 6- Curl the ends of each of the pipe cleaners as shown in the top right photo. This is where you will “attach” your pumpkin. 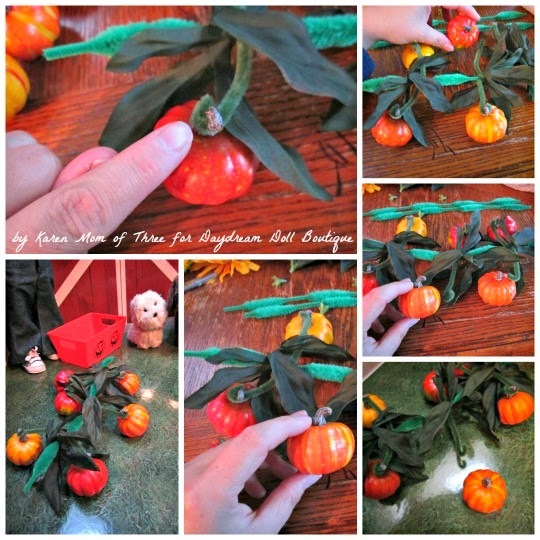 Step 7- Add your dollar store pumpkins or gourds, bending your pipe cleaners around each pumpkin stem. 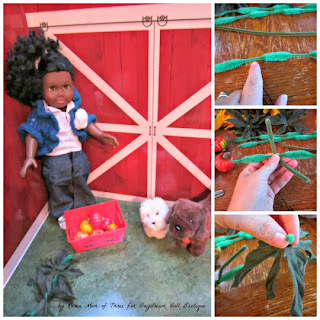 Lay your pumpkin vine on your dolls Farm, I used my American Girl Room Stable but you can use a green piece of fun foam or felt to create your “farm garden”. Use your Halloween container to help your doll with the harvest.